During the 1970’s, the music of progressive rock band Yes carried a message of mystical awakening to millions, and was instrumental (pun intended) in my own inner transformation. With exquisite lines like, “a dewdrop can exalt us like the music of the sun,” they represented for me the ideal spiritual rock music. Fast forward 40 years and Yes are still alive and kicking. But many fans are concerned about the latest lineup changes, replacing iconic founding member Jon Anderson first with Benoit David and now with Jon Davison. Thanks to the generosity of a good friend I had a chance to check out the wisdom of this move at the Warfield Theatre in San Francisco last Tuesday. To my own surprise, of the three Yes performances I’ve seen, I enjoyed this one the most. The material they chose was very different from the usual selection of favorites from their large and rich portfolio. Instead they played three of their greatest albums in their entirety: The Yes Album, Close to the Edge and Going for the One. Great decision! The big question on my mind was, is Jon Davison up to the task? After the opening song, Yours is No Disgrace, I thought, ‘good but not great’. He was in a difficult position. He was not the front man. Steve and Chris shared that role. In the eyes of the audience, Davison was the new boy, replacing the much loved, and some would say wronged, Jon Anderson, who co-wrote most of the bands best songs. It looked to me like he was trying too hard and he didn’t know what to do with himself when he wasn’t actually singing. At least at the beginning. Chris Squire’s bass work was, as ever, sheer genius. When I first heard heard him playing on Close to the Edge decades ago I thought, ‘this guy plays bass the way other people play lead’. He’s still my number one favorite bass player. That other great musical genius of the band, Steve Howe, kept me riveted with his incredibly agile, unique guitar style. In the super crowded field of lead guitarists his sound is easy to recognize but near impossible to imitate. Alan White, although he is no Bill Bruford, provides the solid rhythm bed this complex music needs, matching Squire beat for beat like a glove. The weak leg was, surprisingly, keyboard player and Yes veteran, Geoff Downes. I was dismayed by his poor choice of sounds, and when it came to the glorious climax of Close to the Edge, he didn’t play Rick Wakeman’s part at all – you know, the bit we all look forward to right through the song. Instead he floundered around the keyboard like an inebriated fish – perhaps he was trying to make something up on the spot. Severely underwhelming. I couldn’t understand why he would want to change one of the greatest keyboard lines in progressive rock. It is a demanding part, but not beyond his skill. Hard to forgive. Downes finally picked up the ball on the third album, Going for the One, and regained some of my respect in a superb rendition of Awaken, the highlight song of the whole show. Magical. Meanwhile, Davison relaxed as they worked through the first two albums and he really grew on me. By the time they opened the second half with Going for the One, he was soaring and never came back to earth. I learned a new appreciation of that album listening to it live. It all just rose higher from there. So was he up to the mark? Was he as good as Jon Anderson? I didn’t expect to find myself saying this, but towards the end of the show, he was better. And I say that with some trepidation lest by some remote chance Anderson read these words and think that I love him any the less. Not so. I will always consider Jon Anderson one of my great musical and even spiritual inspirations, especially as a song writer. Despite the painful circumstances surrounding his absence from the band, in a way the wonderful rendering of his music by this fine young vocalist only honors him. 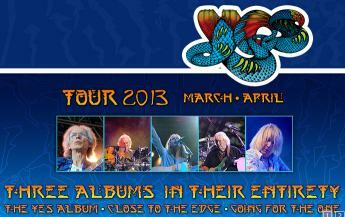 A day will come when the years claim even the powerful Chris Squire and the wiry, meditative Steve Howe. Who could ever replace them? Hard to say who, but in this concert I saw reason to hope that the genius of Yes’s music will indeed outlive the songwriters.